Zen Shin is a unique practice of Meditation combining Shin Buddhism’s awareness of oneness with the discipline of Zen practices. At our sessions sitting and walking meditation styles are practiced and there is typically a brief talk about Buddhism. Zen Shin Meditation is held twice each week on Sunday mornings and Wednesday evenings. All are welcome to participate. Please visit our Zen Shin Meditation page for more information. [fusion_builder_column type="1_1" layout="1_1" background_position="left top" background_color="" border_size="" border_color="" border_style="solid" border_position="all" spacing="yes" background_image="" background_repeat="no-repeat" padding_top="" padding_right="" padding_bottom="" padding_left=""
The Spring 2019 Creative Writing PROSE sessions will be held on February 23, March 9, March 23, and April 6 (note: the location for the April 6 session will be announced later). Anyone high school age and older may participate. Come with a scene in mind. Leave with something on paper, as well as a method for seeing and writing more. 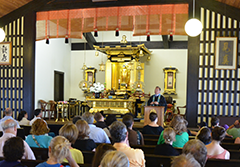 Zen Shin Meditation is held every Sunday morning at 8:30 am – before regular Family Service. All are welcome to participate. Please visit our Zen Shin Meditation page for more information. The first Sunday of each month is the Monthly Memorial Service. As a part of our regular Shin (Jodo Shinshu) Family Service we take a moment to remember and express gratitude to loved ones who have passed away. During Service, children’s classes are also available. Everyone is welcome to attend and for more information please visit our Family Service page or contact our office at 312.943.7801. The Spring 2019 Creative Writing POETRY session will be held on April 13. Anyone high school age and older may participate. Hanamatsuri celebrates the birth of Siddhartha Gautama, who later became Shakyamuni Buddha, in Lumbini Garden. 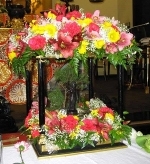 This holiday is commonly known as Hanamatsuri, or Flower Festival. It is also called Kan-bustu-e, or Bathe the Buddha gathering, because at this observance, a statue of the baby Buddha stands in a flower-covered shrine in a shallow bowl filled with sweet tea. Participants at this service come up to the shrine and, using a small ladle, pour some of the sweet tea on top of the small statue. During Service, children’s classes are also available. After service otoki (light lunch) will be served. Everyone is welcome to attend and for more information please visit our Family Service page or contact our office at 312.943.7801. Each Sunday we have our regular Shin (Jodo Shinshu) Buddhist Family Service. During Service, children’s classes are also available. Everyone is welcome to attend and for more information please visit our Family Service page or contact our office at 312.943.7801. The Spring 2019 Creative Writing SCREENWRITING sessions will be held on April 27, May 18, and June 1. Anyone high school age and older may participate. Come joins us at MBT on May 11 for our annual spring clean up! Each year we do a “deep cleaning” of the Hondo, class rooms and social hall. Come join us – Lunch Will Be Served! Register: Sign up on the bulletin board in the Social Hall or contact the temple office at office@mbtchicago.org or call 312.943.7801. “Parent’s Day” service is a tradition started at MBT to honor mothers and fathers together. This service also includes Hatsumairi or First Service presentations. At Hatsumairi, not only do parents present their child to the Buddha but also there are presentations of individuals who want to publicly acknowledge their first service as a follower of the Three Treasures. The Women’s Association and Golden Agers hope you’ll come to our next New Life for Old Bags gathering. 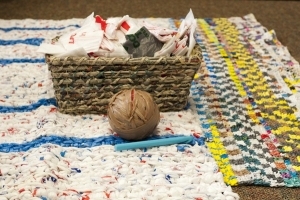 Join us as we recycle old plastic bags and turn them into something useful – sleeping mats for the homeless. NLOB is open to all ages – women, men, girls and boys. Come out to cut, make plarn (plastic yarn), crochet mats and chat. Meet others and visit with friends while volunteering for a worthwhile cause. NLOB collaborates with other nonprofits to make sleeping mats for the homeless. Click here to visit our New Life for Old Bags page for more information about this program. Date: Every second Sunday of the month (note: NLOB does not meet during April, August, or October). Refreshments will be served and welcomed! “Contested Histories” Exhibit – The exhibit opens to the public from 10:45am to 5:00pm. JANM Art Director Clement Hanami will be on hand to answer questions about the collection. “Contested Histories” Exhibit and a program of discussion and presentations. With this special opportunity to host CONTESTED HISTORIES in Chicago, JANM staff and Chicago community leadership have collaborated to offer a series of programs to reflect, discuss, learn and process this collective history. These programs, collectively entitled FINDING HOME (Re)Building a community in the Second City, will take place during the exhibit of CONTESTED HISTORIES on May 17-19. The Spring 2019 Creative Writing SCREENWRITING sessions will be held on April 27, May 11, and May 18. Anyone high school age and older may participate. Each Sunday we have our regular Shin (Jodo Shinshu) Buddhist Family Service. During Service, children’s classes are also available.